27 Mar 2012 in enhanced ebooks paranormal transmedia young adult fiction ~ read. 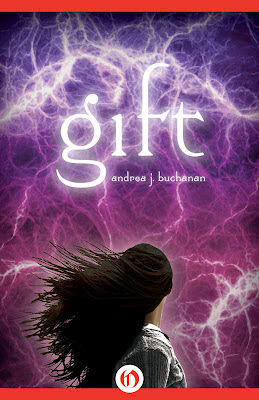 Gift is an exciting new project being released today, from Andrea J. Buchanan, author of The Daring Book for Girls. * *Gift is a new multimedia paranormal YA novel which includes music by Fredrik Larsson, as well as art, videos, triggered events, and a graphic novel story. There’s even a soundtrack and a playable Minecraft map available for download. Gift is not being promoted specifically as a transmedia project, at least not that I’ve seen, but with the variety of media included, and the addition of other media like the Minecraft map, it seems to me that it could qualify as one. The enhanced ebook with the full feature set is only available for iBooks on iOS devices, but the story itself is available for a variety of ebook platforms, including Kindle, Nook, and Google (you may be able to buy the Google book from your local independent bookseller). I haven’t read Gift yet, but plan to. I just wish I had an iPad so that I could have the full experience.